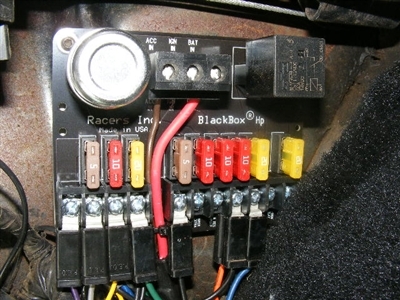 The BlackBox Hp replaces a corroded or damaged fuse panel in vehicles with underdash wiring that's otherwise in good condition. This model BlackBox Hp, is designed for Corvair cars and trucks and fits in place of the original fuse panel. The Corvair model includes Corvair-specific instructions and parts kit. 9-fuse design is not a reproduction; it upgrades the original 5-7 fuse panel, plus it has an option-relay for those who want to get creative and use it to power a fuel pump, headlights, or most any other medium-current accessory.